Apartment for 2 people at the center of a "large village in the countryside"
GUERET, "a large village in the country" in a nature preserve. Pleasant apartment of 25 sqm with a bedroom, a bathroom and a kitchen to prepare and enjoy meals. Centrally located in Gueret, "a large village in the country" in a nature preserve, in a quiet residence, close to shops, various movies and entertainment, indoor heated pool and public media library on site, wifi access Free. Station 5 minutes walk, trains and buses to the main tourist places. 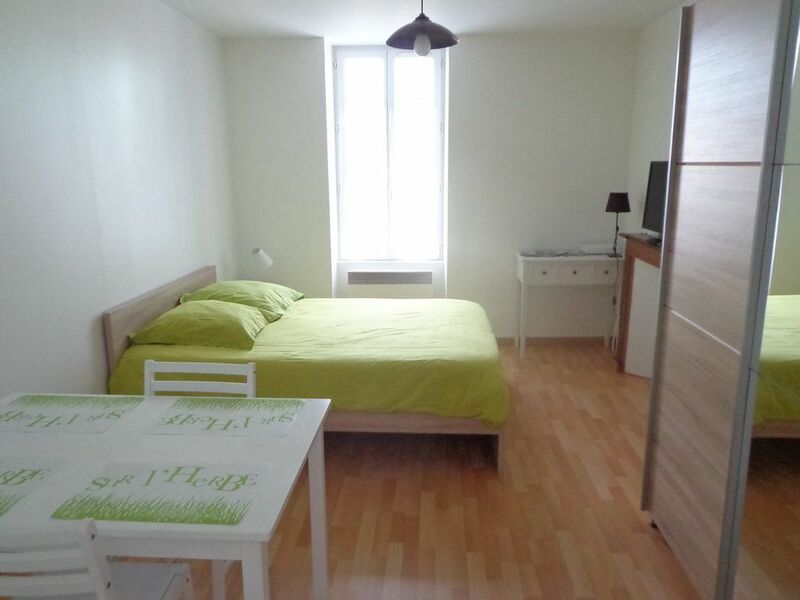 Un petit appartement bien aménagé et largement suffisant pour 2 personnes. Un appartement sans prétention mais fonctionnel, avec tout le matériel nécessaire pour 2 personnes. Bien aménagé, propre et lumineux, à proximité de tous les services mais aussi de la nature (bois magnifiques, lac avec plage). The main tourist attractions are Lake Vassivière, spa Evaux-les-Bains, the old town of Aubusson and its monuments related to the tapestry (home of the upholsterer, museum ..), the ruins of Castle Crozant and the Giant Labyrinth Gueret, located 3 km south of Gueret is the largest permanent hedge maze in the world. The Château de Boussac in the footsteps of George Sand and Pierre Leroux, Castle Villemonteix, rural all the fifteenth and seventeenth centuries Banizette Domaine located in La Nouaille, the Château de Saint-Germain-Beaupré, the castle of Théret. The Senoueix Bridge is located Gentioux-Pigerolles. It is a true idyllic picture of the department. The bridge is listed as a historic monument since February 9, 1990. In the same city the Memorial of the common Gentioux reflects the tragedy of the Great War. Tower Zizim was built in Bourganeuf from 1483 to 1486, on the orders of Guy de Blanchefort, it housed the exile of the Ottoman prince Djem Sultan. The Zizim Tour is listed historical monument. Some lanterns of the dead remain south of the department including St. Goussaud. Stones Jaumâtres located atop Mount Barlot, near the municipality of Boussac Toulx-Sainte-Croix are a heap of granite as can meet many in the department of Creuse, especially at a place called Devil Laugh. They are a natural site. Cascade Jarrauds, located in Saint-Martin-Château in the Creuse is part of the river Maulde. Nine stone steps is a site located in the municipality of Soubrebost, near Pontarion. The pond of Landes: National Nature Reserve since 2004. Located in the Gouzon basin, pond Landes is the only natural lake in the Limousin. Covering an area of ​​about 120 hectares, it is home to flora and fauna remarkable particularly in birds. Ornithologists lovers will find there migrating and nesting herons, cranes, ospreys, crakes ... and a host of ducks.